I've been wanting to try my hand at making a macramé plant hanger for a bit, but just haven't gotten around to it yet. It got me thinking though... macramé is a knot-tying craft, and crocheting is basically knot tying, but with more loops. Could I make a crochet plant hanger instead? The answer is: yes! And you can too. Even if you've never crocheted before, I'm here to walk you through it. Renting is a struggle sometimes because I often want to turn my home into my own, but renting limitations tend to get in the way. Although I can hang things on the walls, the cabinets are strictly off limits because the holes are impossible to fill when we move. Instead, I settled for a renter friendly DIY to make a removable dry erase board inside of one of my cabinets using vinyl. Now, I can write my grocery lists and other notes right in the kitchen where I need them, but the vinyl peels away easily when it's time to make the move. When Janet Lee first moved into her tiny studio apartment, it was a blank box of white walls and neutral parquet floors. As a renter, she wasn't able to add any actual architectural details for visual interest, so she faked the look by bringing plenty of depth to her bland folding closet doors, creating an inexpensive and removable solution that anyone can do at home. The festive season is usually a busy one, and if you’re anything like me, this leads to a serious build-up of mess around by the end of December. Which isn’t great when you’re trying to get back to work in the new year. All those bits and pieces left lying around can clutter up your head space as well as your office space, affecting your productivity! Does your home office or cubicle need some character? Spice it up with this easy hand-printed fabric memo board that you can easily make yourself with a piece of white material and some fabric paint. Click through to check out the easy tutorial. Everyone I know is on an organizing kick, myself included, now that the new year has rolled around. And one of the places that I have the hardest time keeping clean is my home office and craft space. So I thought it would be fun to create a wall-mounted organizer for my office supplies and share it with you guys. Keep reading to check it out. Sometimes wall art just needs to be fun. To celebrate the little moments, I made this DIY graphic confetti art with the saying “Make Life a Party” and it’s sitting on my desk as a reminder to see the positive side of things. It’s really easy to make, and I’ll even share how to make your own confetti if you want something specific. January is a time for getting organized and making resolutions to STAY organized. Easier said than done, right? To start small, try making this simple DIY chalkboard calendar that you can reuse every month to keep your dates straight. Store it in your office or use it as a command central for your family. The great thing about a chalkboard calendar is that it's easy to use and erase when plans change because they always do! I've been practicing macrame a lot recently and even though I'm still a beginner, I love creating unique projects with this basic twisted macrame pattern (as you may have seen in my DIY twisted macrame keychains earlier this week). 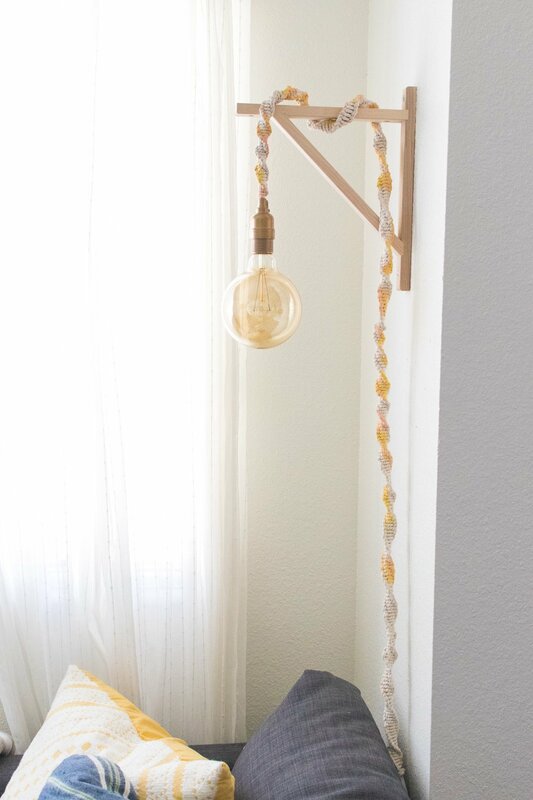 Because I have a love for Edison light bulbs, I'd planned to create my own dangling wall light in our living room for months, and this simple macrame wrapped wall light DIY was the perfect solution. Full House Tour: Our 2017 Curbly House Renovation is Complete! The 2017 Curbly House is done! It went on the market last weekend, and (to my surprise and delight), we've already had several showings. After two-and-a-half months of intense renovation work, it feels a little weird this week, knowing there's nothing left to do except blog about it. I keep checking my 'To-Do' list, and it's all crossed off, which is my JAM! Check out our Facebook Live tour of the entire house. Scroll down for the full, room-by-room reveal of the 2017 Curbly House, along with complete product lists (from our featured vendor partner, Hayneedle) and details about how we transformed each space. September is National Sewing Month, and in honor of the occasion, we're taking a deep look at one of the most versatile materials out there: fabric! From sewing pillows to creating statement wall pieces, there's no limit to the way you can use fabric in the world of interior design. Here are 99 of our favorite tips on how to use fabric to decorate every room of your home. You don't have to be a tailor to use textiles in your space. From no-sew curtains to fabric as wallpaper, there's a project out there for everybody! We've all seen our fair share of ugly ceiling light fixtures. We've also see our fair share of DIY ceiling light fixture cover ups. Here are six of our favorites ceiling light covers, all of which can be adapted to various styles so they serve as much as how-to's as inspiration for our own creations. Enjoy! The IKEA Raskog cart. It's easy on the eyes, super versatile and best of all - it's cheap. Ringing in at $30, the Raskog fits in most people's budgets. It is sold as a kitchen cart, but it can be used for so much more. Here are ten great ways to use it in every room of your house. I love a good before-and-after, don't you? There's so much satisfaction in taking a sad roadside find or cheap garage sale rescue and totally transforming it into something new and different. We've rounded up some of our favorite furniture makeovers to inspire you to either start that upholstery project, get out the spray paint, or hit up this weekend's local yard sale scene. From dressers to dining tables, here are some of our favorite furniture makeovers. I love a quick art project! As I was preparing to (finally) hang some art on my walls, I was thinking of ways to keep my costs low and make my own wall art and the answer was as simple as making this paint scrape art with a few colors that matched the scheme of my home. Within 5 minutes, I had a colorful piece of art that I love. Spring is in the air! To me, spring is always, first and foremost, about color. It's also my favorite time of year to keep flowers in the house, but this can be a very expensive habit. Instead, I've committed to getting my flower fix by picking one or two flowers from my daily walks to display in small bud vases. To honor each bloom, I wanted to whip some special bud vases to give them just-the-right place to live. Organization: you either love it or hate it. No matter your stance, having a good system of organizing is the key to a clean, calm living space. And who doesn't want that? We've rounded up our favorite organization tips and DIY projects to help turn your home into the oasis it should be. What are your favorite organization tips? Let us know in the comments!